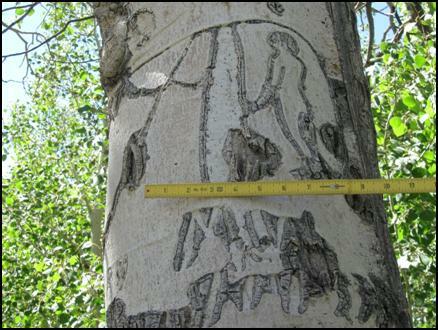 Over a period of three days, 20 PIT volunteers and Forest Service archaeologists documented a large grove of aspen trees containing a variety of unique historic tree carvings. The carvings dated from 1917 to the 1950s, with a few more recent carvings from local hunters. Crews recorded a total of 81 trees containing a total of 471 interpreted glyphs: 106 names, 102 initials, 156 dates, 32 messages or statements, 12 geographical locations and 63 graphics. Most of the carvings we documented date between the 1930s and the late 1940s, and dramatically illustrate the life and thoughts of the male sheepherders who tended their flocks in the area. Most of these men came from the Basque region of Spain, as indicated by the language in which the carvings are written and the names and regions they discuss. 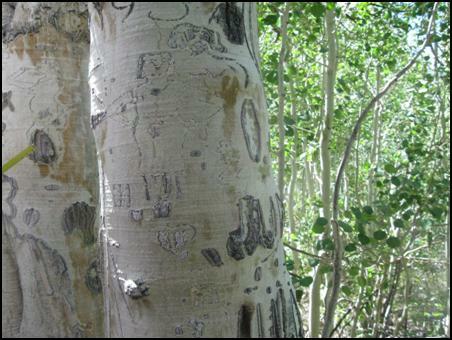 These men used the white bark of the aspen tree as palate of sorts to communicate and express their lives as sheepherders and their desires, thoughts and political opinions about the events occurring in the world at the time. 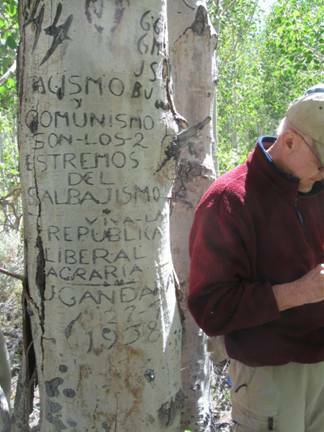 One of the more memorable herders who documented his political beliefs on the trees was one Joaquin Gandara. Known for his elegant cursive style, he made numerous statements about the Spanish Civil War, which occurred in Spain from 1936 to 1939, and involved a political conflict between the Nationalist military forces and the established Republican government. The conflict divided the country and casualties were in the hundreds of thousands before the war was over. The Nationalist forces overthrew the Republican government in 1939 and established the military dictator Francisco Franco. Gandara expressed his support for the Republican faction when he carved “Viva La Republica Mueran Los Facistas JG 1937,” translated “Long live the Republic, Death to the Fascists.” Another carving on the same tree contains the date 1937 and immediately below is an image of a female in what appears to be a military uniform (above). This image may be associated to an icon that was used to recruit for the War. Other carvings made in 1938 by Gandara illustrate his loyalty to Spain such as “Joaquin Gandara 1938 Viva La Republica Muerta Los Facists ” and “Facismo y Communismo son-los-2 estremos del salabajismo Viva la Republica Liberal Agraria J Gandara 27-7-1938,” translated “Fascism and Communism are the 2 extremes of savagery, Long live the liberal agrarian Republic” (right). These carvings demonstrate the passion he felt for his country, despite being thousands of miles away and living in a foreign land with only sheep and trees to listen to his thoughts and emotions. Various forms of women, sheep, horses, bota drinkers and dancers, carved in an elegant, fine-line style, are found throughout the grove. These images, created over 70 years ago, remain to tell the story of the vibrant Basque culture that these men carried with them – thousands of miles from their homeland – as they made a meager living by herding sheep in the Glass Mountains of California. PIT volunteers donated over 372 hours of their time while documenting this important piece of history, which is rapidly deteriorating due to age and weather. 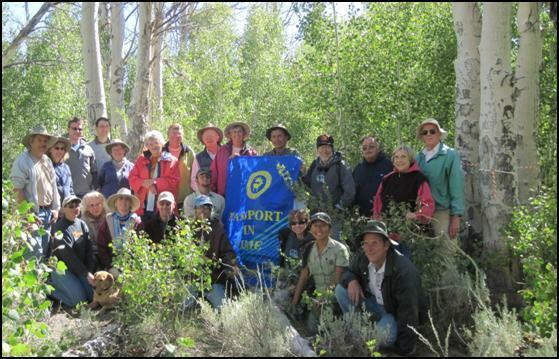 Thanks to all the staff and volunteers, and especially to Nancy Hadlock and Richard Potashin, local Basque experts and interpretative staff at Manzanar National Historic Site. These latter two folks provided the background knowledge on the grove, taught us how to read and interpret the glyphs, introduced us to the Basque bota drinking competition, and shared traditional Basque stories around the fire one chilly August night.